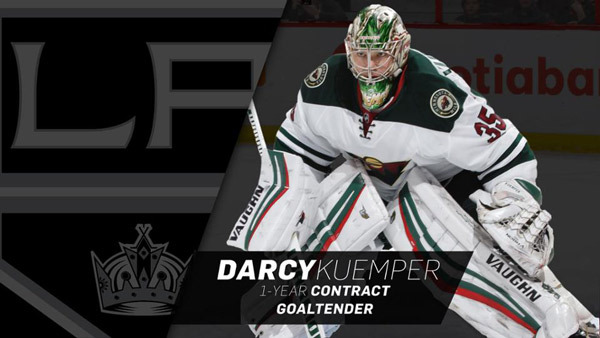 The Los Angeles Kings have agreed to terms with unrestricted free agent goaltender Darcy Kuemper on a one-year contract, Kings Vice President and General Manager Rob Blake announced on July 1. Kuemper’s contract will have an Annual Average Value (AAV) of $650,000. The 27-year-old Kuemper (born May 5, 1990) is a 6-5, 215-pound native of Saskatoon, Saskatchewan who appeared in 18 games last season with the Minnesota Wild, posting a record of 8-5-3 with a .902 save percentage and a 3.13 goals-against average. Drafted in the sixth-round (161st overall) by the Wild during the 2009 NHL Entry Draft, Kuemper has played in 102 career NHL games, with a record of 41-34-14, a .910 save percentage, 2.60 goals-against average and seven shutouts.